Patrick Flack outlines his research in Northern Ireland in the latest in our series for budding writers (see www.bps.org.uk/newvoices for more information). Despite experiencing a sustained period of peace since the end of violent conflict, Belfast remains a divided city, particularly in working-class areas. Protestant/loyalist and Catholic/republican communities occupy their own areas marked out by flags, murals and graffiti. The general consensus has been that segregation in general has increased through time in a ‘ratchet effect’, with large increases particularly after outbreaks of violent conflict, yet little or no decrease when violence declines (Shuttleworth et al., 2004; tinyurl.com/jyd8dzt). Due to the lack of contact and continued suspicion of the ‘other’, homogeneous communities perceive real and symbolic threats from their segregated counterparts. It is partly as a result of this perceived threat that, despite decommissioning weapons in 2009/2010 and calling a ceasefire over 20 years ago, paramilitary organisations continue to exist. Paramilitaries often manipulate fear within their respective communities, leading that community to demand protection from paramilitaries. News reports still claim that paramilitaries bid to control working-class communities and often take the law into their own hands by carrying out ‘punishment-style’ attacks (Kilpatrick, 2014). 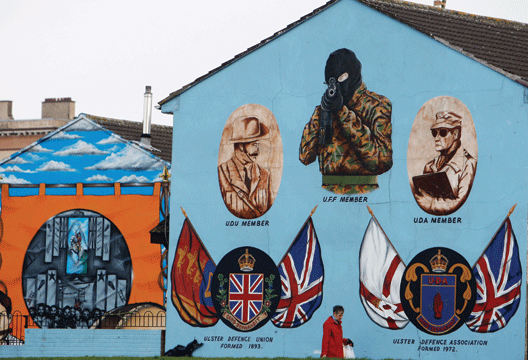 In February 2014 a ‘Join the UDA’ mural appeared in a loyalist part of County Antrim (tinyurl.com/pgexrqp). Reed (2011) notes that loyalist paramilitary organisations still retain a presence in Protestant working-class areas ‘that is unlikely to wane rapidly’ (p.46). The main justification for the existence of the paramilitaries – organised armed conflict – has ceased, so why do they still eke out an existence? Very little psychological research has been carried out into loyalist paramilitaries or the loyalist community in general: interested academics have instead largely originated from sociology, politics, history and criminology. In addition, relevant research has mainly focused on the republican community, for a variety of reasons, such as its increased willingness to engage with researchers and the greater interest shown in the republican story due to ‘romantic’ storytelling (see tinyurl.com/hpuzvue). With the exception of recent work by Professor Neil Ferguson and colleagues (Ferguson et al., 2015), there has been little social psychological research into post-conflict loyalism. However, researchers from other disciplines have identified the positive changes that loyalist paramilitary leaders are trying to bring about within their organisations (e.g. Shirlow, 2012). These changes have involved ‘demilitarising’ their organisations in order to adopt a more community-centred role, whereby loyalist ex-combatants are developed into what Habermas (1992) called ‘responsible participants’ and are involved in various conflict-transformation initiatives. These initiatives have involved former loyalist combatants developing cross-community groups to prevent interface violence and working with republicans to promote shared history (Shirlow, 2012). These ‘progressive elements’ of paramilitary organisations have been differentiated from ‘regressive elements’ which are reluctant to adopt a peaceful and positive role in society. Yet when people outside the loyalist community think about this group of people, they are invariably reminded of the negative aspects that are espoused repeatedly by the media: violent protests (McKittrick, 2013), drug trafficking (Kearney, 2014) and racist crime (McDonald, 2014). Indeed, the views of media commentators in Northern Ireland and the opinions of the general public as expressed in radio and TV phone-ins would suggest that almost everyone opposes paramilitary organisations and sees no justified reason for their existence. This widely shared societal norm helps explain why some communities prefer to stay quiet. It would be wrong to claim that a significant number of people from working-class communities support paramilitaries; however, their relationship with – and attitudes to – paramilitaries are complex and nuanced. If a community member vehemently opposed paramilitaries, they would be conforming to the overarching societal norm, but would be undermining the authority of the particular organisation that ‘operates’ in their area. Conversely, if a community member were to show any level of support or acceptance of paramilitaries, they could be viewed by others (mostly those outside of their community) as fuelling the continued existence of paramilitary organisations. Despite their still visible presence in working-class communities throughout Northern Ireland – through the continued display of paramilitary murals and flags – I suspect that people who live in communities that have a meaningful paramilitary presence are conditioned not to think about them. This reluctance among sections of the working-class community to talk about paramilitaries leads to stumbling blocks in my research, as one of the studies carried out for my PhD project involved doing exactly that – speaking to members of the Protestant working-class community in order to elicit their views on loyalist paramilitary organisations. When I got to know and listen to members of working-class communities in Belfast, it was sometimes hard to criticise their tacit acceptance, and at times explicit support, of these organisations. The loyalist community speak in contradictory ways about loyalist paramilitary organisations, often beginning their accounts by stating how they are opposed to paramilitary presence in their area and feel that they only serve malevolent purposes. However, these negative accounts of paramilitaries are often juxtaposed with justifications for their continued existence. For example, when speaking with a group of young adults, one member of the group began by saying, ‘Paramilitaries don’t serve any purpose here, all they are interested in is dealing drugs and making money.’ However, later on in the focus group, the same participant stated, ‘If these organisations didn’t exist, all the local hooligans would be running riot, thinking they run the place.’ I have found that these contradictory accounts are common as individuals strive to make sense of these groups. So why working-class communities in particular? The rhetorical contexts in which the loyalist community justifies the existence of paramilitaries simply would not feature for individuals living in more affluent areas. The lack of social order that working-class community members cite as a potential consequence of an absence of paramilitary presence – drug-dealing, joyriding and burglary, etc. – is an issue far removed from the leafy suburbs of middle-class Belfast. Also, working-class communities in Northern Ireland – on both sides of the political divide – generally do not have a good relationship with the police service. This is partly due to the legacy of the Troubles, when police officers moved away from these communities and residents became disengaged and lacked identification with the police (Byrne & Monaghan, 2008). Many loyalists are also aggrieved by what they perceive as ‘political policing’, viewing the handling of loyalist parades and protests as uncompromising and threatening. Despite acknowledging the nefarious activities that loyalist paramilitary organisations have been involved in, the loyalist community regularly cite the basic human needs of security and safety as justification for the existence of these groups. It is hard to argue with these accounts; however, this discourse reveals a lot about the mentality that exists within these communities. It would appear that individuals residing in loyalist areas perceive a significant portion of their community as incapable of restraining their emotions and actions in the absence of paramilitary jurisdiction. Loyalist paramilitaries have maintained a presence in some Protestant working-class areas for over 45 years, so the attitude that these organisations keep an unrestrained mob of hooligans at bay can be summed up by the idiom, ‘better the devil you know’. Some community members have become accustomed to the presence of paramilitaries, and some say that they don’t even notice it – so why take the risk of calling for the removal of paramilitaries? Although recruiting participants for these focus groups was extremely laborious, I learnt a number of techniques along the way that made the process easier; these approaches could help other budding psychologists who are also researching ‘hard to reach’ populations. Within ‘hard to reach’ groups, a victim mentality often exists. This mentality is particularly prevalent within the loyalist community in Northern Ireland, whereby they often feel as though they have lost out in the peace process. This loss is perceived as zero-sum – with every loyalist loss being associated with republican gain. Effective consideration and negotiation of this victim mentality can prove beneficial for the research process. There is a perception amongst the loyalist community that they ‘don’t have a voice’; members of this community feel that this is due to being stereotyped as uneducated bigots and not being represented by mainstream unionist politicians. In the early stages of my research, loyalist community members were unsurprisingly reticent about participating, generally appearing suspicious and apprehensive of my research agenda. However, potential participants seemed more enthused when I negotiated their victim mentality and associated perceptions. None of this negotiation involved dishonesty – I merely highlighted aspects of the research that would resonate with the target population. An example of a statement provided was ‘This research allows loyalist community members to have their say and be given a voice’. One of the reasons why ‘hard to reach’ populations remain as such for so long is that they are often misunderstood, and their reluctance to take part in valuable research only fuels their ostracism. Although loyalism has received mostly negative attention recently, its positive aspects cannot be protected and promoted if the community is not willing to explain this to outsiders. By shutting themselves off to people who have a genuine and honest interest, community members merely confirm negative connotations of loyalism. Despite this community’s association with xenophobia and violence, the contradictory ways in which community members talk about paramilitary organisations reveal at least a modicum of potential for positive change. This can only be realised when there is a meaningful mobilisation of people who are prepared to oppose those who wish to return to conflict. If this community’s collective feeling of victimisation and threat can be effectively quelled, disruptive elements who repeatedly make headlines could effectively ‘lie low’ and, to quote a phrase that was repeatedly used by focus group participants, ‘get on with their lives’. Byrne, J. & Monaghan, L. (2008). Policing Republican and Loyalist communities: Understanding key issues for local communities and the PSNI. Joseph Rowntree Charitable Trust. Institute for Conflict Research. Ferguson, N., Burgess, M. & Hollywood, I. (2015). Leaving violence behind. Political Psychology, 36(2), 199–214. Habermas, J. (1992). Moral consciousness and communicative action. Cambridge, MA: MIT Press. Reed, R. (2011). Blood, thunder and rosettes: The multiple personalities of paramilitary loyalism between 1971 and 1988. Irish Political Studies, 26(1), 45–71. Shirlow, P. (2012). The end of Ulster Loyalism? Manchester: Manchester University Press. Shuttleworth, I., Lloyd. C. & McNair, D. (2004, August). Measuring local segregation in Northern Ireland. Paper presented at the International Population Geography Conference, University of St Andrews.